Stationary Die Change Tables usually are installed at the rear sides of the presses and built as a T-shape. die to be used and to park it at a parking position up to its use. park it at a parking position on the Die Change Table, until it will be transported. position and not any longer needed, after start up of the delivered new press die. 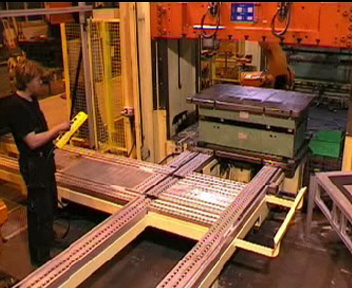 The stationary Die Change Table as T-shape is equipped with pneumatically operated die lifters with rolls, on which the press die will be lifted ready for movement. The die lifters with rolls are positioned within T-Slot-Housings, which are fixed on top of the Die Change Table. They are equipped with big rolls, which allow an easy moving of the press die. At parking position the rolls are lowered, which gives a very safe standing to the press dies and prevents them from rolling away. In case of Die Change Tables with motorized operation the press dies are moved motorized. This is done by the integrated die mover "Mark II" with hydraulical or pneumatical drive motor. With the Mark II the press dies can be moved into the press, out of the press or lateral to the parking positions. The motorized movement of press dies on die changing tables qualifies very good for heavy press dies. Details regarding the system "Mark II - Die Mover you will find on our Page "Die Mover"